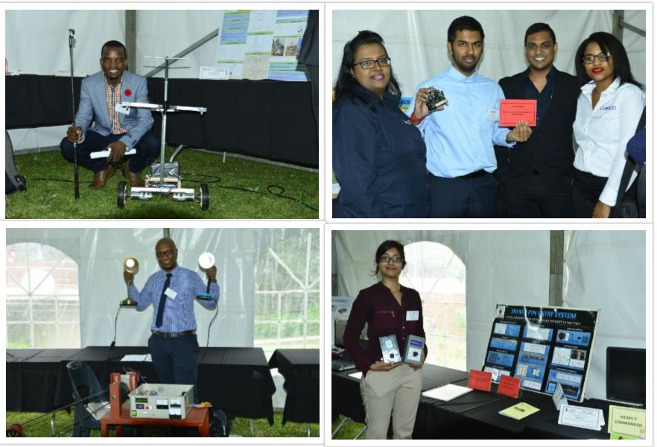 The Disciplines of Electrical, Electronic and Computer Engineering (EECE) recently hosted their annual Open Day on the Howard College campus, where 114 final-year students displayed their innovative final year projects to hundreds of visitors, including their families and friends, UKZN staff, external sponsors, examiners and the media. The students began their projects in July and operated on a tight deadline, with topics allocated by supervisors and based on industry needs. They also worked within a limited budget to achieve their objectives, and balanced this project with six other modules. Naidoo described how engineering disciplines underpin a wide range of industries, from the finance, medicine and transport sectors. The designs presented on the day included an intelligent golf cart, a hexapod, tracking systems, an irrigation pump controller, a micro-hydroelectric power station, smart security systems, a persistence of vision display and much more. ‘It was a tough, long experience but the end product is exciting,’ said Mr Nivaan Krishundutt, who won the Council for Scientific and Industrial Research (CSIR) Modelling and Digital Science Award for the best final-year Computer Engineering design project for his Raspberry Pi Port Distributor enabling access to remote hardware ports. Mr Scott Eyono’s project involved the smart reading of urine test strips by enabling a camera attached to a computer, or an application on a smart phone, making for a convenient and cost-effective diagnostic tool. Eyono received two CSIR Modelling and Digital Science Awards for the most innovative design project and best final-year student in Computer Engineering. Ms Divina Govender’s easy-to-use, safe, smart PIN entry system earned her the Reutech Communications Award for the most innovative design implementation by a final-year student in Electronic Engineering and the Altron TMT Management Services Award for the best final-year student in Electronic Engineering. Mr Akshay Maharaj received the Conlog Award for the best final-year Electronic Engineering design project for his analogue to digital converter (ADC) module, and Mr Sandile Khumalo’s design and implementation of a computer graphic plotter earned him the PFK Electronics Award for the best control systems project. Mr Jared Sigamoney, who received the UKZN Centre for Power and Energy Systems Award for the best final-year student in Electrical Engineering, designed methods to protect generator stator winding. He also received the Society for Automation Instrumentation Measurement and Control (SAMIC) Award for the best final-year Electrical Engineering project. Mr Preshen Naidoo’s inventive design of a smartphone near-field communication (NFC)-based access control system for campus access control, class attendance logging and payments for campus-related purchases won him the Avantcore Award for the most disruptive EECE design project. Mr Kumeshan Reddy received the best final-year student in power systems award from the South African Institute of Electrical Engineers (SAIEE) KwaZulu-Natal for his design of a low voltage electrical supply for the EECE building. Twenty external examiners from industry and academia assessed the projects. A number of projects in each discipline were highly commended, and other awards presented included those for second- and third-year students who have excelled.